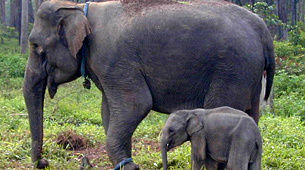 The herds of Southwest Cambodia offer one of the few realistic opportunities for conserving the Asian elephant in Indochina. Southwest Cambodia, specifically the 1.4 million hectares of the Cardamom Conservation Landscape, provides some of the most extensive, relatively intact habitat in the region. It is also a CITES MIKE site. Nonetheless, elephants are pursued, as they are across Asia, by organized hunters and traders who profit from selling body parts such as ivory and bones for carving and medicinal uses. Almost 10% of the existing elephant population has reportedly been slaughtered to feed this trade over the last four years. This project will fund a field assessment by a Cambodian national that provides information on professional elephant hunters, traders, trade flows, and other information on trade volumes and consumer markets in the CCL. It will also support a pilot effort to catch and convict selected hunters and traders that the assessment has identified.